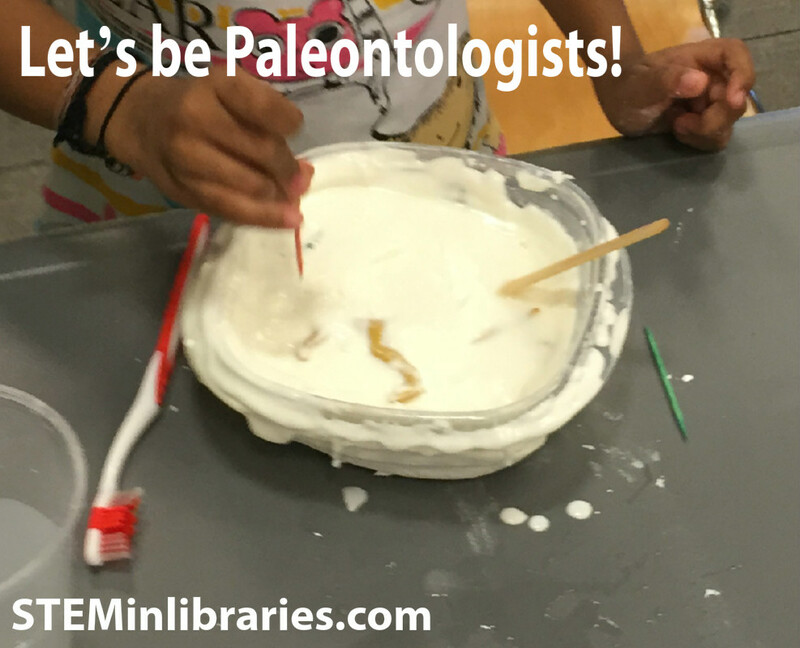 Week Fifteen: Let’s be Paleontologists! 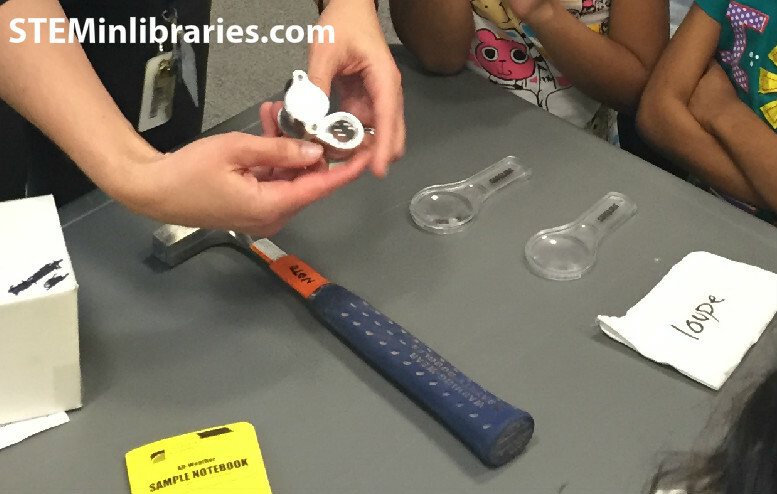 Program Title: Science Explorers, Jr.: Let’s be Paleontologists! Make Dinosaur Excavation pits, 2-3 days in advance. 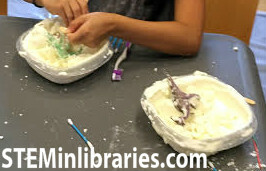 Fill the bottoms of the containers with Oobleck (a mixture of water and cornstarch, equal parts), and place plastic dinosaurs inside the container. There s hould be enough Oobleck in the container to hold the plastic dinosaurs in place, but not enough to cover them. You can also place shells and amber-colored beads in the container for added interest. Set the containers out to dry. Oobleck dries the best, and fastest, when out in the sun. When the Oobleck has harden, make a fresh batch of Oobleck and use it to completely cover the dinosaurs. Set out to dry. 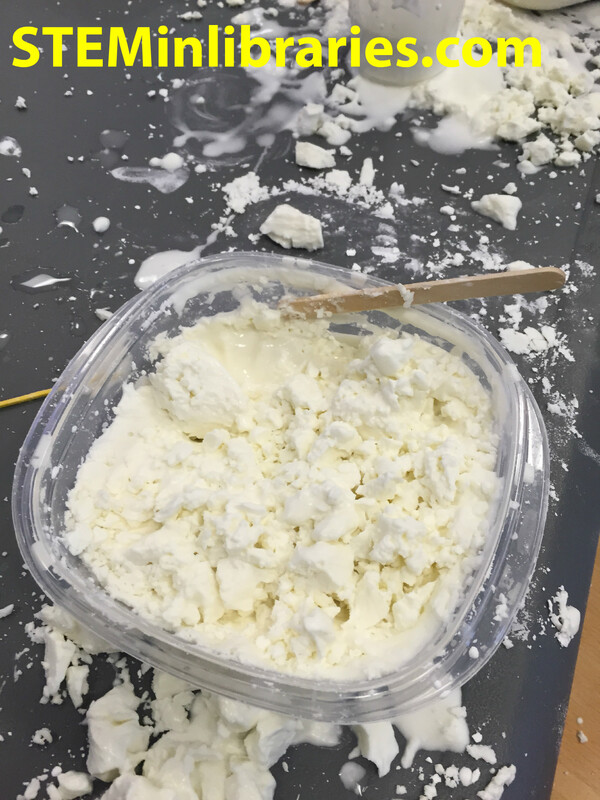 Depending on how much Oobleck there is in the containers to dry, it can take anywhere from 4 hours to 2 days to dry. 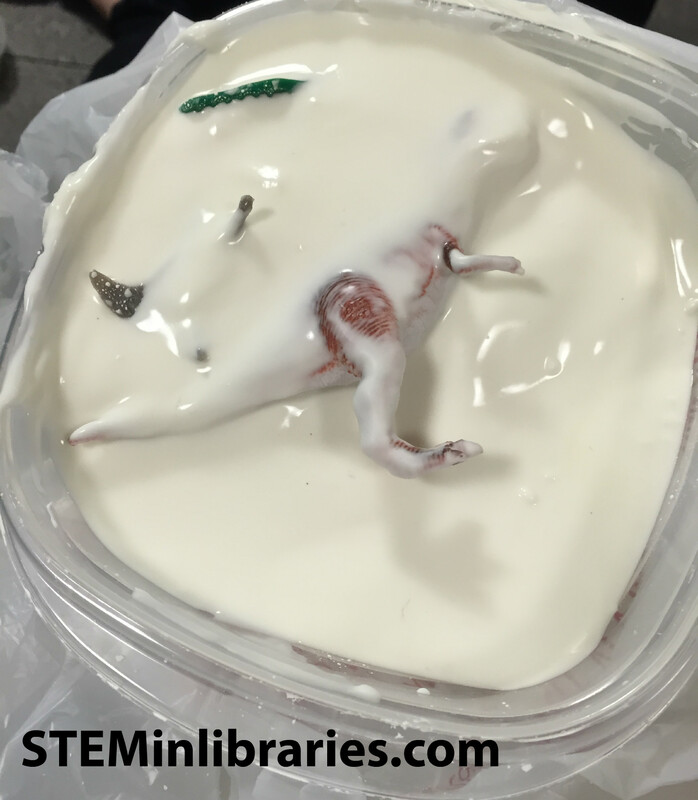 Please note: Plastic Dinosaurs will float to the surface of wet Oobleck, therefore it is important to cement the dinosaur initially in the shallow layer of Oobleck and let it dry. Optional: Make a dinosaur memory card game, using these cards as reference. A local university’s Paleontology department loaned us a sample of tools and fossils to show the children for this program. If there is not a local university to contact, the Smithsonian Institute’s Department of Paleobiology has an interactive game that nicely illustrates the tools used by Paleontologists. Give each child their own Dinosaur Excavation Pit, and tools to dig out the dinosaurs. 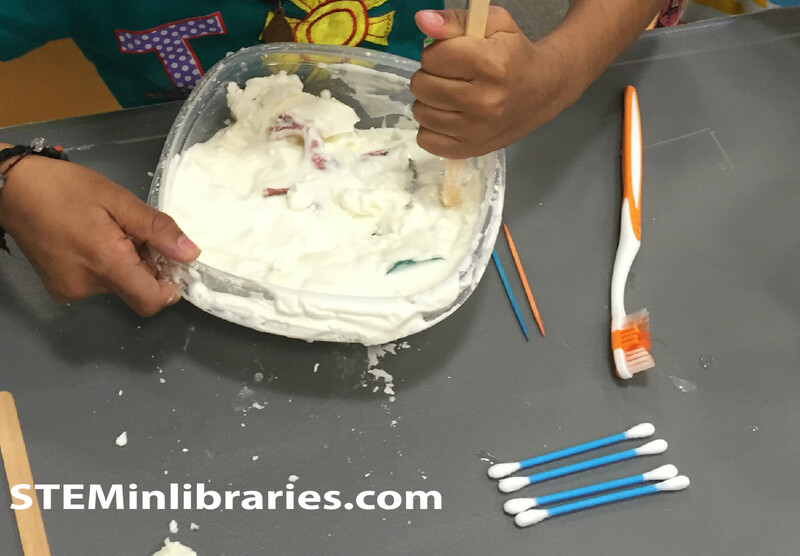 For tools, we used toothbrushes, toothpicks, and Popsicle sticks. We also had water on hand to clean off their finds. 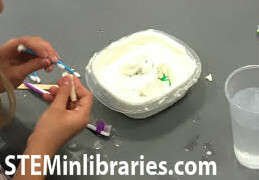 For a slightly cleaner time, demonstrate how to use the tools to dig out the dinosaurs. If a child had particular trouble with their pit, we had a mallet on hand to whack the bottom of the container with, to help in loosening the excavation pit. Skype with a Paleontologist. Our local university agreed to a Skype visit for the program, and the children asked questions. Dinosaur identification. Have the children identify what dinosaurs they have discovered, using either reference books or the Dinosaur Set 1 flash cards by Montessori Print Shop. Dinosaur Memory Game. Using the Dinosaur Set 1 flash cards on the Montossori site, make a memory game. Have children play the game and learn dinosaur names. This was a fun, but messy, program. When we set out water for the children to use to clean their finds off, we did not anticipate them using the water in the excavation pits themselves. Adding water to the excavation pits made them very “muddy” and very Obleck-y! We had tarps down under the tables, but tarps can only do so much, and the room was covered in Obleck! Thankfully, it cleans up fairly easily, but given the rather unexpected messiness of the program, we would consider holding it outside. Additionally, drying the Obleck to make the excavation pits took much longer than we expected, in a large part due to the weather. We made the Obleck two days in advance. The first day was very sunny, and the Obleck dried fast, within a few hours. The second day was overcast, and the Obleck was still damp after 24 hours. We also found that covering the Oobleck with a lid actually retains the moisture, and makes the Obleck slightly gelatinous. Given those conditions, we would opt to offer this program in the summer, to make full use of the heat and the sun in drying the Ooblek. Children in Preschool and Kindergarten would enjoy playing with the excavation pits, so the program can easily be used for a younger audience. An older audience would not find the activity very challenging, so it is not recommended to age this program up.